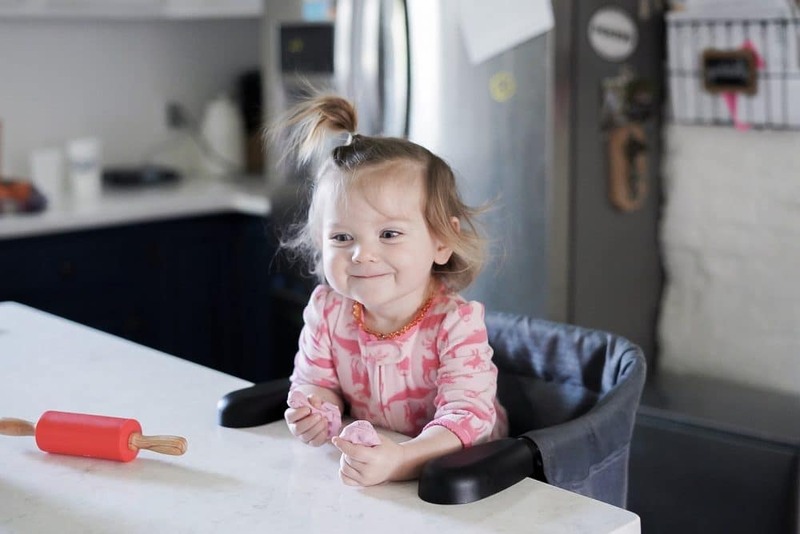 Can you even handle Olive’s face here? 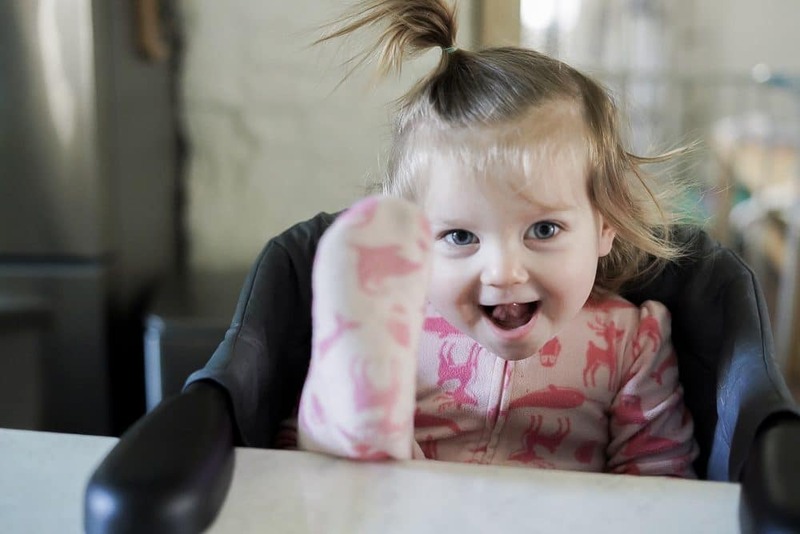 She is giddy with excitement over our (finally) perfected soft homemade playdough recipe. And I’m just so excited too. 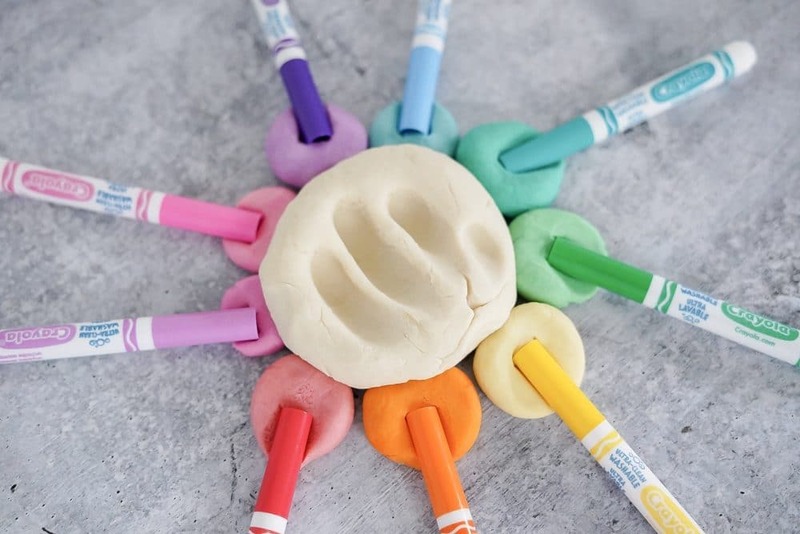 Besides the perfect recipe, we’ve got a fun new spin on playdough play that is such an engaging addition to your making session. Seriously… I practically needed my own batch! We are no stranger to mixing up doughs. 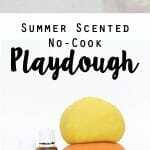 This summer scented no cook playdough is a blog favorite on Pinterest. 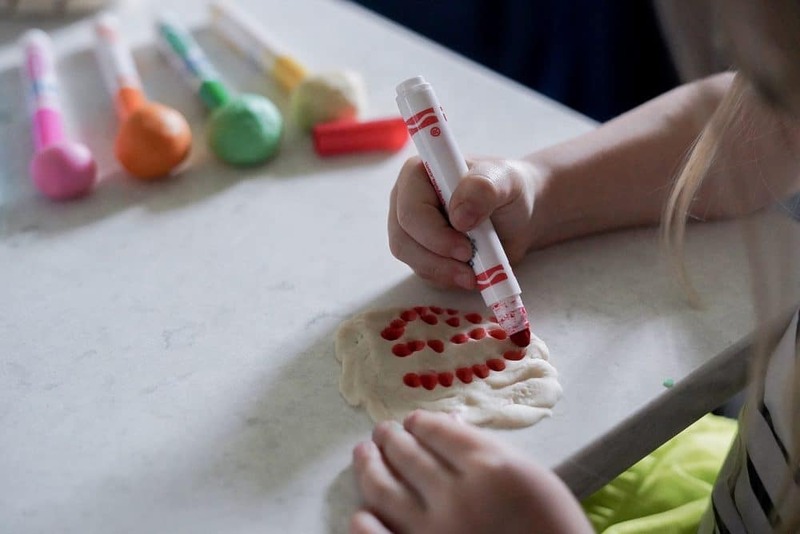 And this pumpkin spice latte playdough is even more popular. 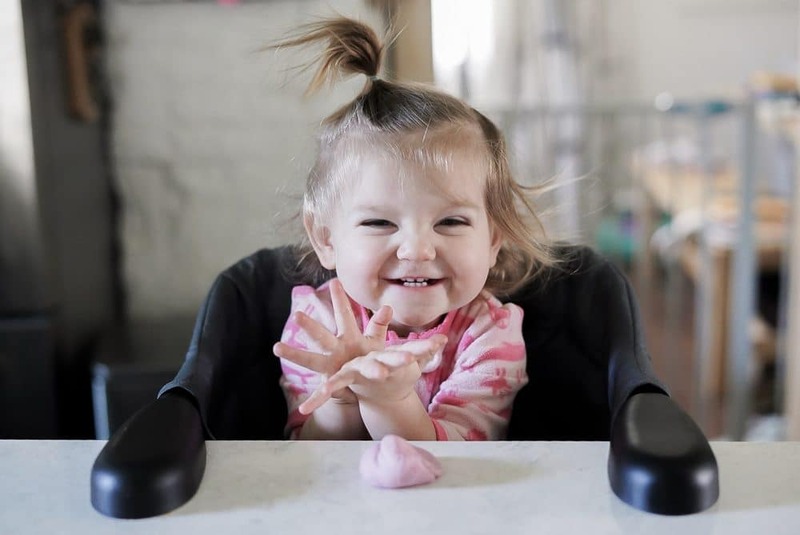 Sometimes Sal and I just mix cooked playdough up for the joy of getting messy. 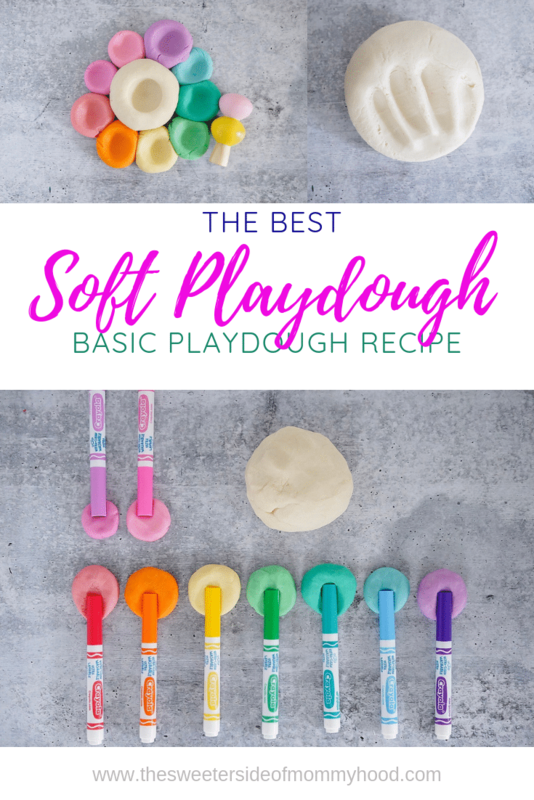 I’ve made this playdough recipe before but I never have glycerin on hand so it’s not a go-to for me. 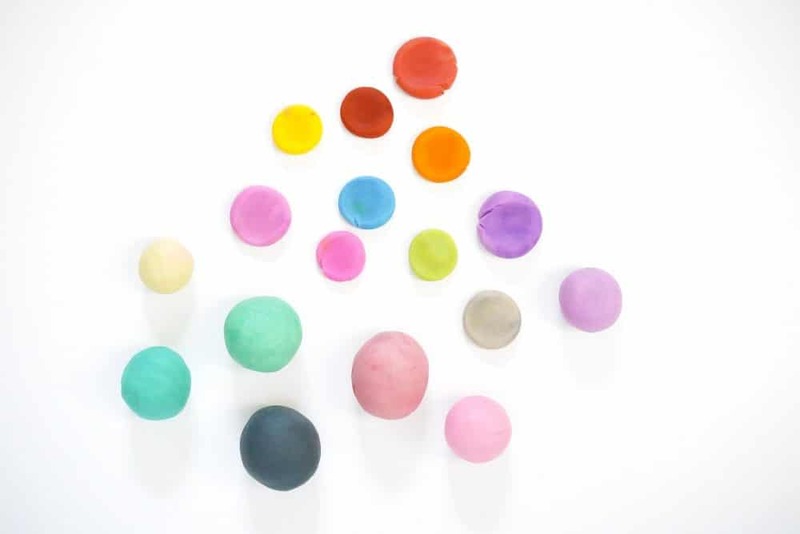 But I really wanted to come up with my own BASIC playdough that could be a starting point for your own experimenting. 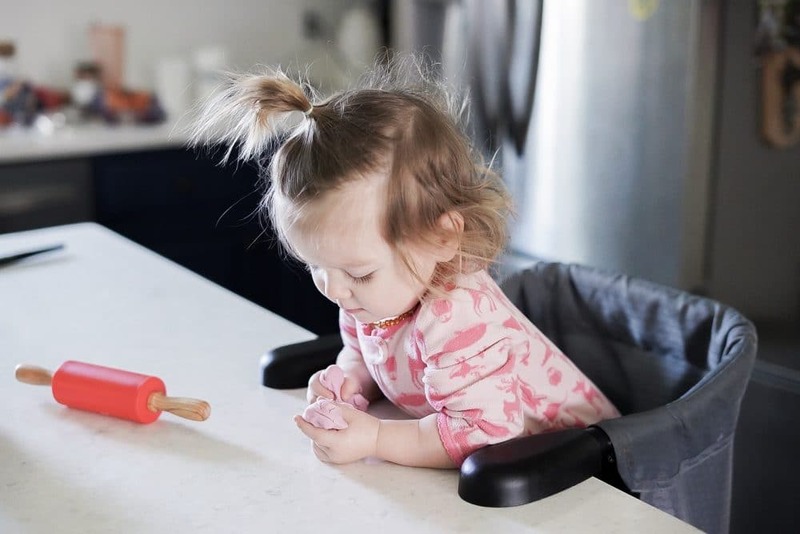 First, let’s make the playdough! Add dry ingredients to a mixing bowl and stir together. Drop in the oils. Add the boiling water. Stir together with a spatula then switch and use your hands. 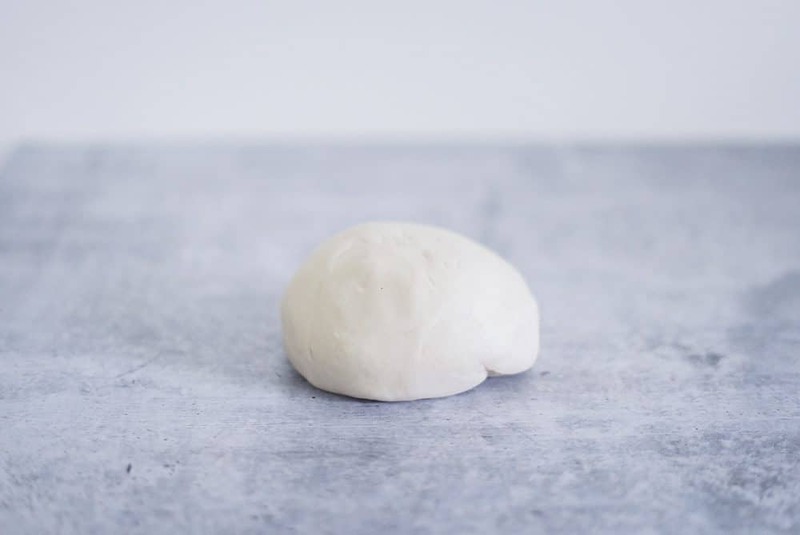 Tip the dough out of the bowl onto your table surface and stand kneading. If it’s not too hot let your kiddos jump in and squish the dough around. 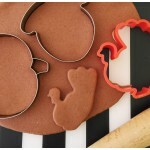 They LOVE to feel soft warm dough squishing through their fingers as it comes together. 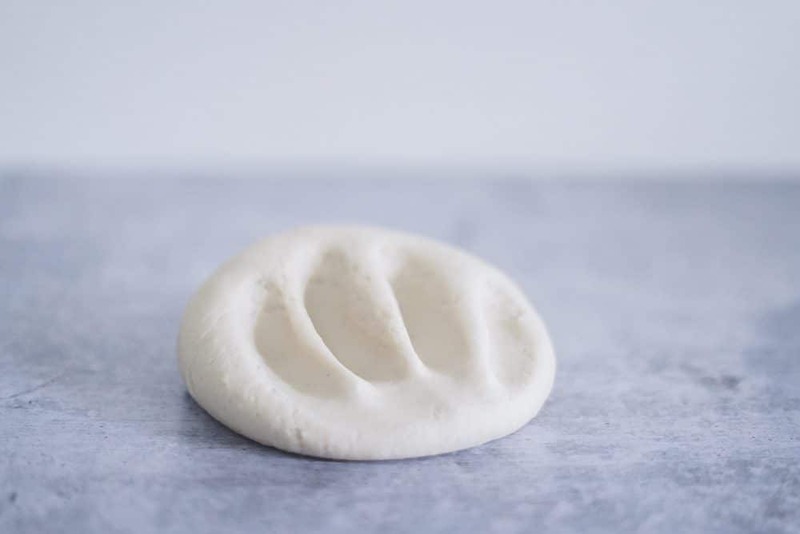 My soft homemade playdough recipe feels so silky and smooth. 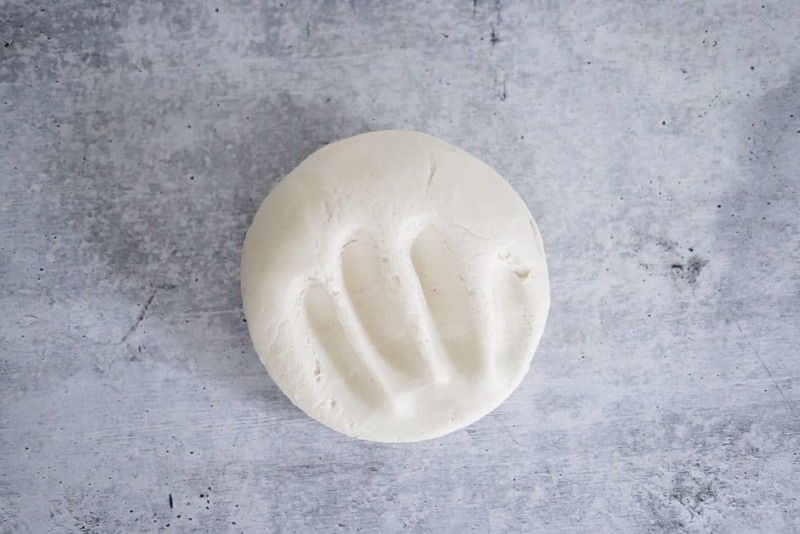 The coconut oil is great for your hands and takes away from the salty smell just enough to be appealing. 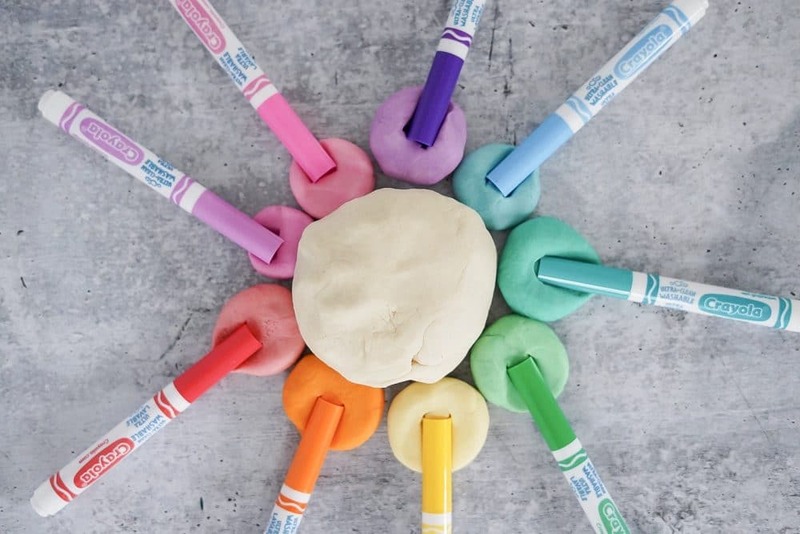 You’ll notice there is no coloring agent in this playdough recipe so far. Just hang in there. It’s coming! 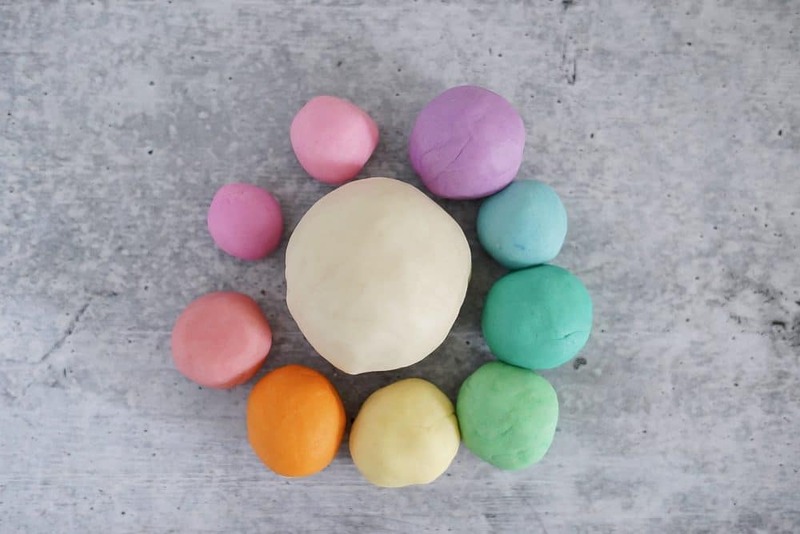 So what gives this soft homemade playdough recipe it’s color? Figured it out? We created our amazing rainbow of playdough colors by using markers to color onto our finished playdough! This was SO much fun for the girls. 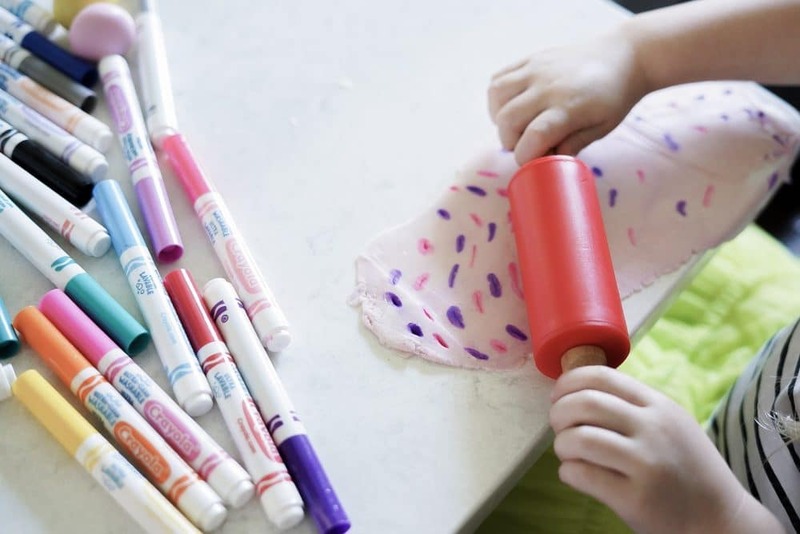 They made color after color after color, kneading the marker into the dough and adding more. Mixing colors, making it darker. It was so fun to watch them experiment. Olive didn’t do too much coloring but she sure did a lot of squishing! She did a little lounging too. Look at her feet up on the island! 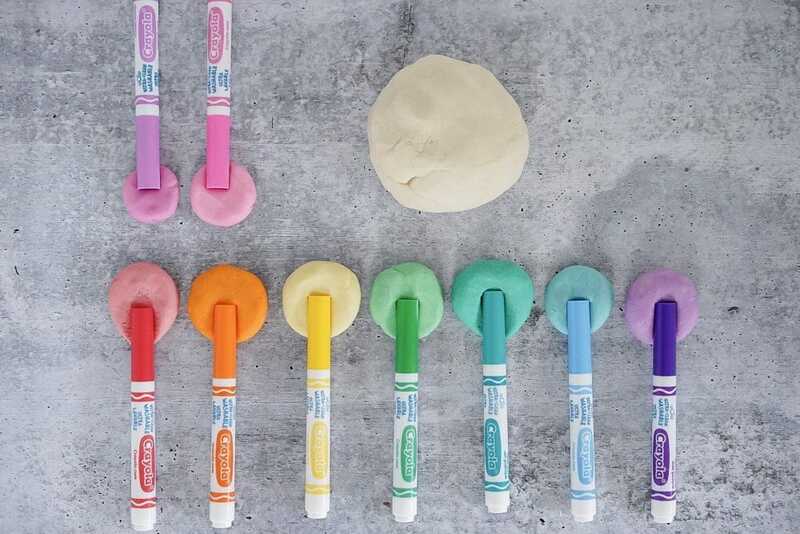 Using the markers to color the dough, we were able to make a crazy rainbow of colors. I made some samples for photos then the kids just went to town! 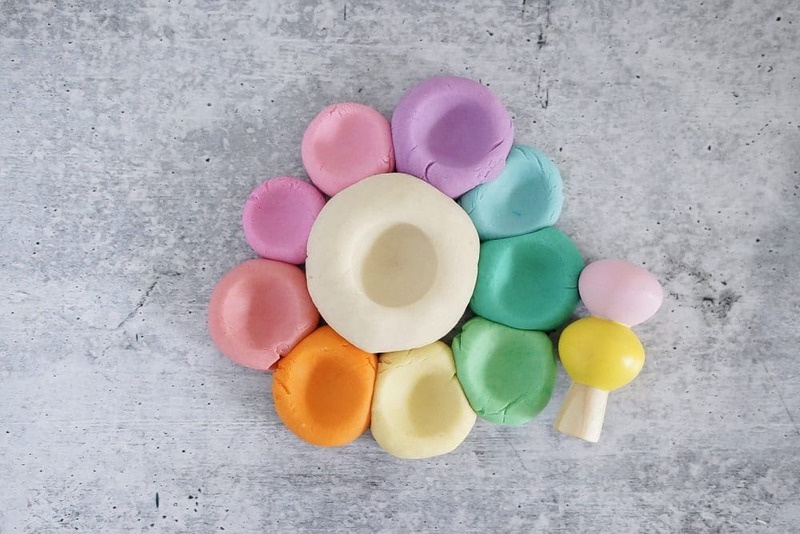 Brb… dreaming up some wooden playdough tool sets. Wouldn’t that be so fun?! 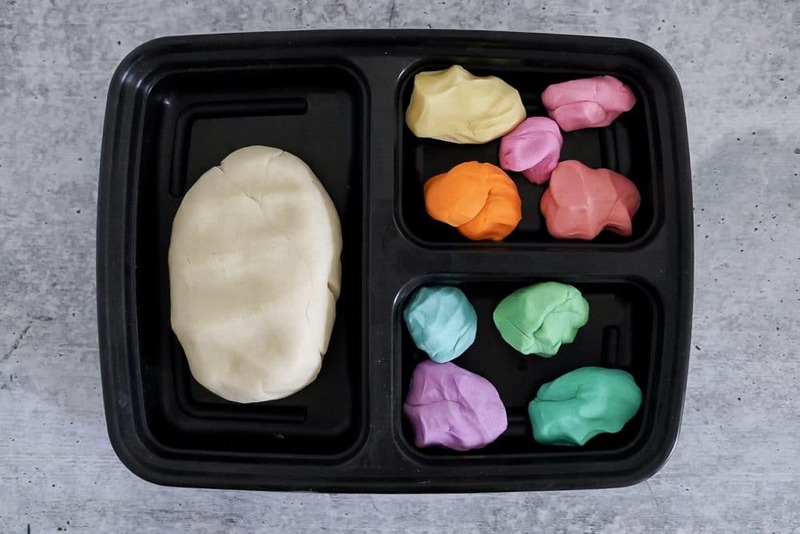 It would be so much fun to use this soft homemade playdough recipe as a color mixing and color theory lesson for preschool or even elementary school aged kids. 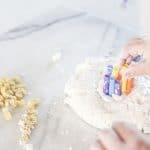 Such a fun sensory play experience and unique way to add color. Modify this recipe and make it your own! Hope you love this recipe as much as we do- if you give it a try be sure to tag me @sweetersidemom in your photos on IG! Love to share what people are creating with their kiddos! 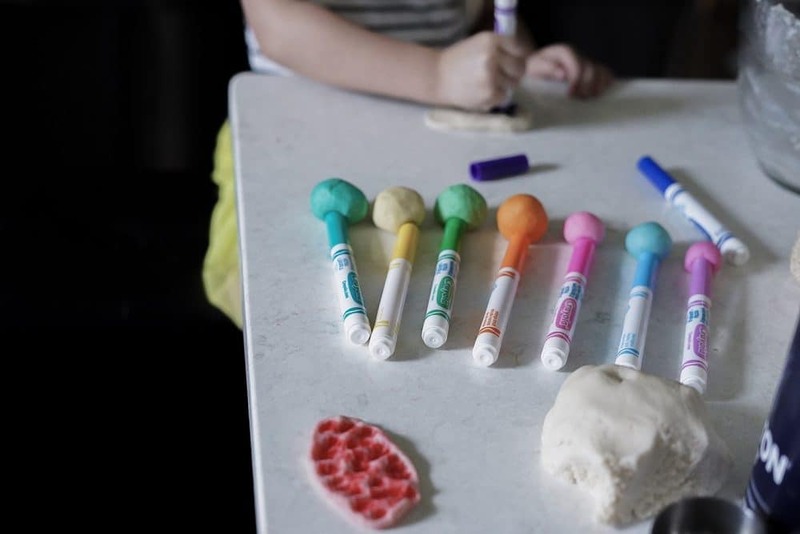 Fun and Easy Crafts for Kids : Experimenting with cooked play dough and messy hands. 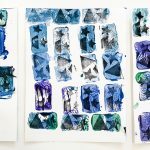 « Process Art summer camp – at home!